Today was Thursday and Regarding Babas Leelas I am not going to say anything. I will simply append few photos taken today and on 25th July, Guru poornima day at Marietta, GA, USA. 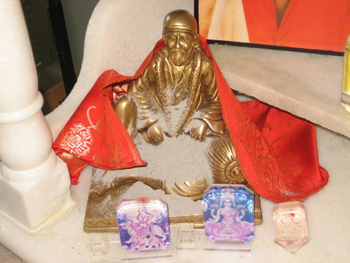 This Thursday Mrs. Gupta did the prayan of Extracts from Sai Satcharitra after the recitation of Sai Amrit Vani. However the group did the prayan of Chapter 39. Next Thursday it will be Chapter 40. Next Group recitation of Sri Sai Amrit Vani will again be held at 2953 Nestle Creek Drive, Marietta , GA 30062. at usual Local time from 11 AM to 12:15 Noon. 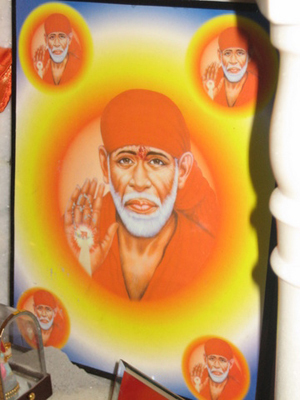 For the benefit of the Sai Devotees a new web site www.mysaibaba20.info has been developed giving all information about Baba, Shirdi, Sai Satcharitra and Sai Amrit Vani. 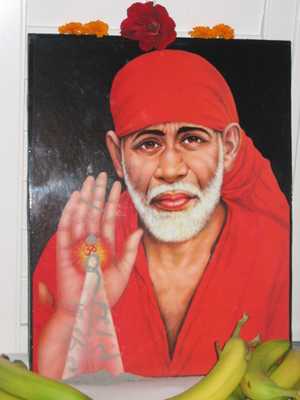 Devotees are requested to visit this site, bless it and may offer their comments. You can listen, download the audios and scripts from there. I have already circulated the letters of the devotees for the prayers for 29th July 2010, Mrs. Veena Gupta ( Veena Maa as the devotees call her) prayed for all the devotees during the Pooja and the recitation of Sri Sai Amrit Vani . Please address your requests for prayers only on email id veena_gupta_2000@yahoo.com and do not bother all the 8700+ honorable members with so many letters. We will club the letters in 3 parts and circulate all the non-confidential, Non-private letters to the members. Please do not forget to mention that you will be reciting/reading or listening Sri Sai Amrit Vani/Sai Satcharitra with us on that Thursday (Any time, if 11AM to 12 is not possible). Letters without the (1) Names (2) place (3) Date of Thursday (4) Assurance that they will be reciting Sri Sai Amrit Vani and/or Sai Satcharitra are not included in the list of devotees. Correspondence with them individually is also not possible. 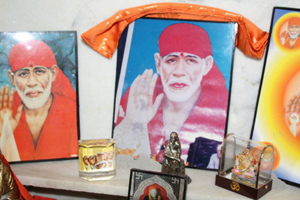 On every Thursday, twice at 11 AM (Indian Standard Time) and 11 AM (Eastern Standard Time), Sai Bhakti Radio (http://www.saibhaktiradio.com) is also broadcasting Sai Amrit Vani. This activity of Sri Sai Amrit Vani and Recitation of Sai Satcharitra will be in addition to any other pooja or sewa or prayer that you may be doing. © Copyright www.mysaibaba20.info All Rights Reserved.